Hares: Daily Male & Helene !!! 1300 start time on Sunday (April 17th) so try to arrive early!! - Use excalators to exit the subway area. - Find MASH HASH chalk marks and take a left on the top and follow the west side of the stadium until you get to the stoplights at the big intersection there. You'll have the park area and the former garbage dumps (mountains) right in front. 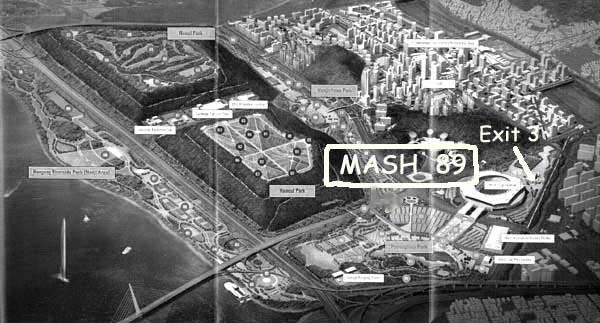 - Cross the streets and walk parallel to the street but inside the fence to the very end of the parking lots and look for MASHers. - Look for marks along the way! - Get ready for another classic MASH Hash! You can leave a bag and whatever food, etc in the cars while running (or walking). - Locate World Cup Stadium on a map. - Find parking lot west of the stadium, closest to the garbage dumps. You'll have to drive along the park and make a U-turn to access the parking lot. - Once parked, get ready for another classic MASH Hash! Call 011-9148-6661 or 011-793-7886 if you are late or lost! There will be the usual snacks and drinks afterwards. There may be a grill for the BBQ-minded! We encourage everyone to bring something to share during the on-after mixing!